In a food processor, combine the flour, sugar and salt. Add the diced butter and pulse in 1-second bursts until the mixture resembles coarse meal. Combine the ice water and apple cider vinegar and drizzle it on top. Pulse in 1-second bursts until the dough just comes together. Turn the dough out onto a work surface, gather up any crumbs and pat into 2 disks. Wrap the dough in plastic and refrigerate until chilled, about 30 minutes. On a floured work surface, roll out 1 disk of the dough to a 12-inch square. Cut the square into quarters and ease each piece of dough into a wide-mouth 1/2-pint jar. Repeat with the remaining dough. Refrigerate until chilled, about 15 minutes. Preheat the oven to 350°. Set the jars on a sturdy baking sheet and line each crust with foil, pressing it to the edges. Fill with pie weights or dried beans and bake for 20 minutes. Remove the foil and weights. Press out any bubbles and bake the crusts for about 30 minutes longer, until golden brown and cooked through. Let cool. In a large saucepan, combine the quartered figs, diced pears, apple cider, eau-de-vie, honey, lemon zest, lemon juice, cinnamon, cloves, allspice and salt and bring to a boil. Simmer over moderately low heat until the figs are plumped and the pears are tender, about 20 minutes. Strain the poaching liquid into a heatproof bowl. Discard the lemon zest. Set the fruit aside. Return the liquid to the saucepan and boil until it is reduced to a thick syrup, about 12 minutes. Spread the walnuts in a pie plate and toast for about 7 minutes, until fragrant. Let cool, then coarsely chop the nuts. In a bowl, whisk the mascarpone with the crème fraîche, honey, maple syrup, lemon juice, vanilla and salt. Drizzle half of the pear-fig syrup into the pie crusts. Top with half of the mascarpone cream followed by all of the fruit and the remaining cream. 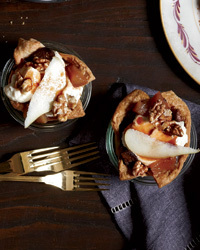 Garnish with the pear slices, walnuts and the remaining syrup and serve. The pie crusts, fruit filling, syrup and cream can be refrigerated separately for up to 2 days. Recrisp the crusts before filling.